For Drilling Stone, Tile, Glass Bottles, Shell, Ceramic, Concrete Porcelain and more.. These diamond core drill bits are still our most popular tools for drilling through hard materials. Sometimes referred to as diamond hole saws, they will produce a hole in whatever you put in front of them. Read on for more detailed information and technical specifications, including the approximate inner core diameters of each. 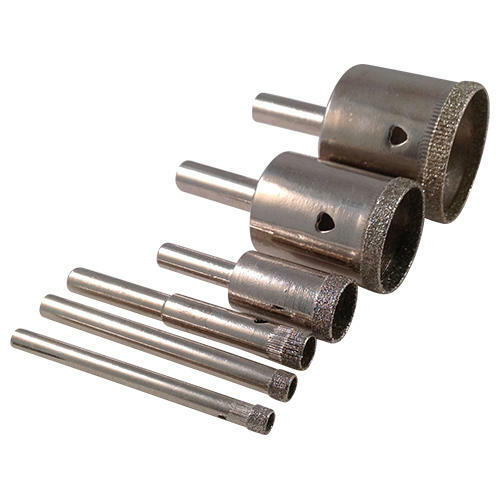 Very common with hobbyists, scientists, craftspeople, artists, builders, plumbers, shop fitters and DIY enthusiasts these diamond core drill bits are used for drilling holes in bone china, porcelain plates, glass, ceramic, fossil, bone, mirrors, stone, concrete, bathroom tiles and fish aquariums. Whether you are interested in purchasing just one diamond core drill bit for a DIY or craft project or hundreds as a professional tradesman we have the right sizes for you. If you are a jeweller looking for sizes as small as 1mm - 3mm, please visit this page. If you are using a hobby type rotary tool such as a Dremel, or a pendant drill you might like to try our Bottle Neck Diamond Core drills. These have a 2.35mm shank. Helpful Note: The size indicated refers to the size of the hole you will end up with. If you are looking to achieve a core rather than drill a hole please see the techincal tab for the internal diameter of each core drill. 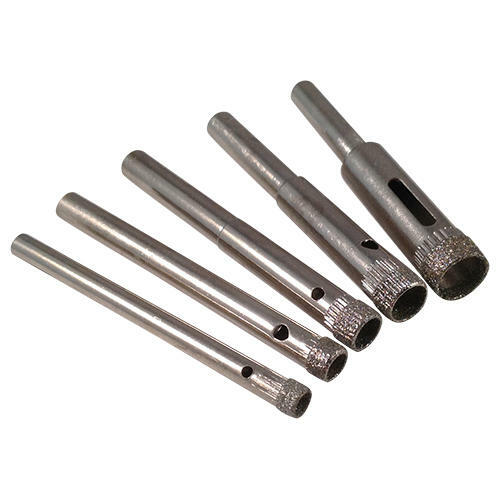 For example if you need to extract a 3mm core, choose the 5mm drill bits size. Disclaimer. Using rotary tools near water has never been, to the best of our knowledge, endorsed by any of the rotary tool manufacturers. If you do choose to drill near water or with attachments under water connected to your drill then you do so at your own risk. Please be aware that mixing electricity and water can be very dangerous. Please note. 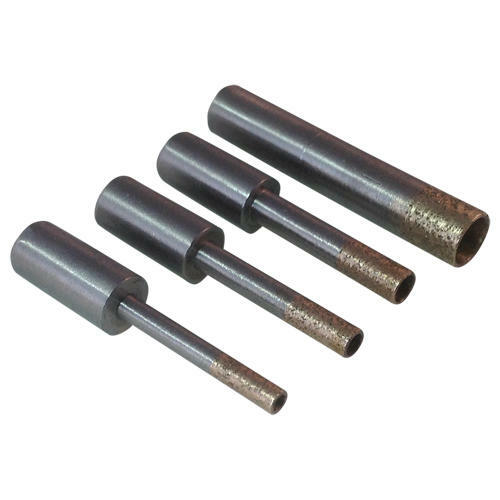 These diamond core drills have been manufactured with a precision outer diameter for drilling a hole, To drill a core, the inner core diameter sizes are shown below but should be taken as an approximate measurement. Did the job I required perfectly. Did the job that they were purchased to do (expanding a the inlet and outlet ports in some ceramic pump heads) drill bits did wear out after a period of time so more than one was needed to complete the job. item did well for for managing to drill 2 holes through porcelain tiles, but too worn to do anymore. However, for the price I didn't expect much more and it was all I needed it for. Did the job I needed them too so can't, be faulted, excellent price too. Bought these to drill holes in carved stone pendants. Big improvement over tungsten carbide bits. Well made and does what it says on the tin! Quality product. Its perfect for my projects. have used them extensively since they were delivered. good quality and achieve good results. 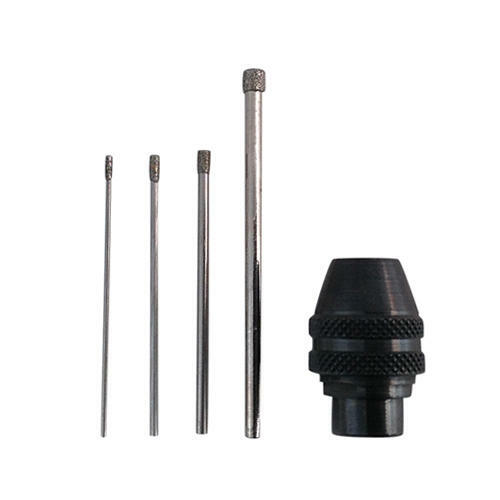 Are the diamond core drills suitable for a generic drill or does it need any coupling device? Thanks in advance. 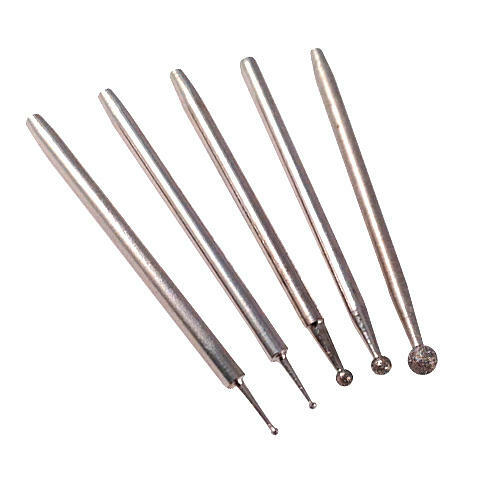 Yes, the diamond core drills are suitable to use in a regular, generic drill, no adaptor is needed. Thanks for your question Ricardo, I am sure others will find this helpful too. I want to get a cylinder core out of stone. Is this possible? Thanks Marianne, a good question. Yes, this certainly is possible and we have lots of customers who use them for just this purpose. However, please note that the diamond core drills are intended for drilling a hole rather than extracting a core so we cannot guarantee the precision of the cylinder. Take a look at the technical tab to find out the internal diameter of the diamond core drills so you know which size to order. 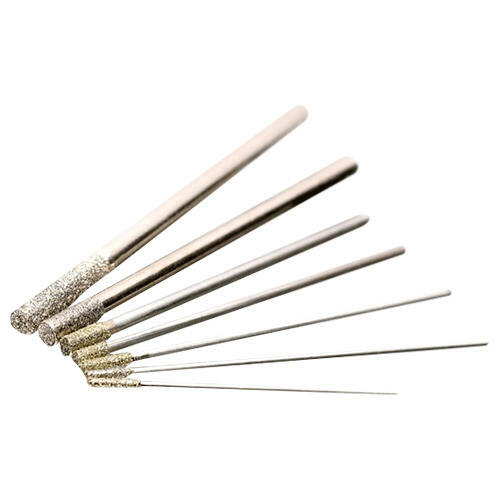 We have a wide range of diamond files perfect for this (try the 600 grit medium diamond files) or you could try smoothing it with a diamond hand pad. If you want to go further and create a smooth, shiny finish, then we have various polishers and abrasives that will do this. Hi, whilst looking for some small diamond bits I happened to read your bit about using core drills to make tea light candle holders, do you do a set of the sizes required to do this? There's a full tutorial of how to make a tea light candle holder with links to the product pages of the bits you'll need (42mm diamond core drill to make the initial hole and a smaller one to break down the core you're left with) and a diamond cylinder burr for smoothing out the blind hole. 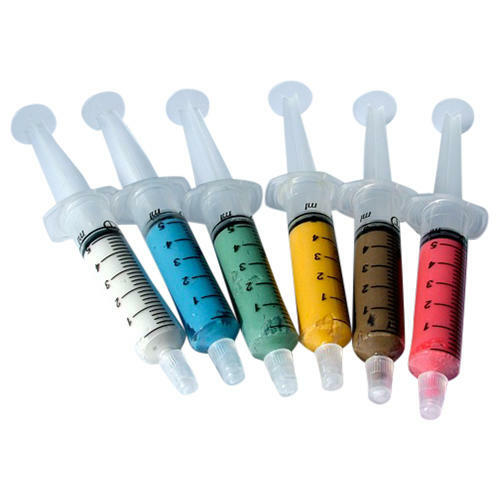 Hello, If I purchase diamond core drills, how can I keep them from skating around on Bottles, especially say 16mm size or so, without a starter bit ?. Also is it possible to drill this size hole in Bottles with the v tip ,type of glass/ tile drill, which would tend to get a bite amost immediately ?. Any help appreciated. Regards Ken. We've tried all manner of drill bits over the years and we find the core drills most efficient at cutting, especially if you want a nice clean hole (you can't get this with the V-tip bits). Depending on what type of drill you're using we have either the standard core drills for use in a regular drill, or the Bottle Neck Core drills - ideal to use if you're using a Dremel type drill with a chuck. To prevent the drill bit from skittering across the surface, angle the drill before the initai cut. Once that first chip-cut is made put the drill to a vertical position and continue drilling through. If it's convenient to do so you can also add a strip of masking tape. Personally though I find this clogs the diamond grit up a bit and it can be a bit more fiddly. These are a couple of articles we wrote that may help. The first is how to cut a hole in glass bottles and the second is cutting a glass bottle. Will the 3mm shank fit a Dremel tool? You will need the Dremel Multi Chuck attachment or Dremel Collet Nut Kit in order to use these drills with your Dremel rotary tool. We recommned the multi chuck over the collet nut kit as you don't need to keep changing the collets. 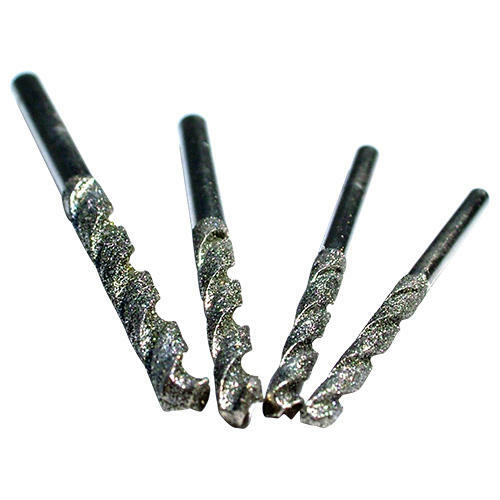 If you would like to try a variety of sizes of drill bits, we do the Diamond Drill Bits set for your Dremel Tool. 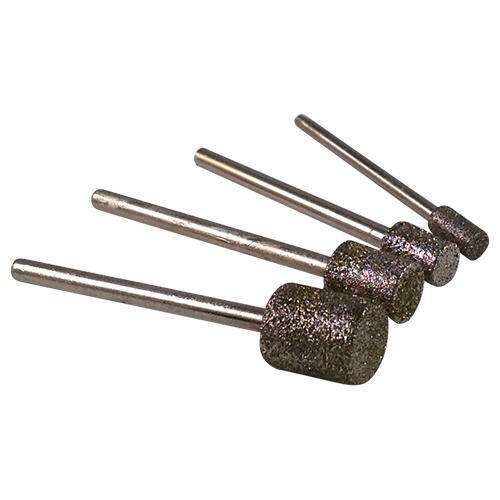 This includes the chuck along with an assortment of diamond drill bits. There's more detailed information on the product page under the 'Description' tab and 'Technical' tabs. 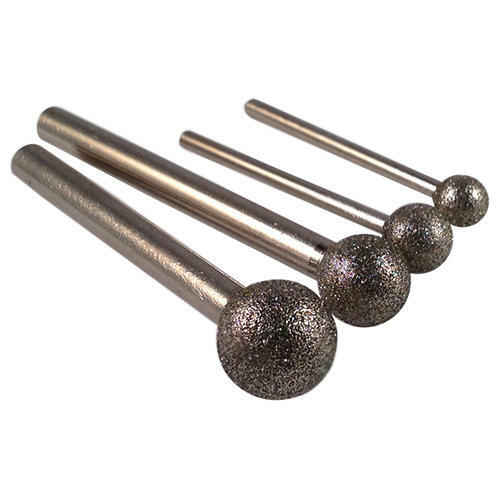 Are these suitable for drilling into hardened steel ? 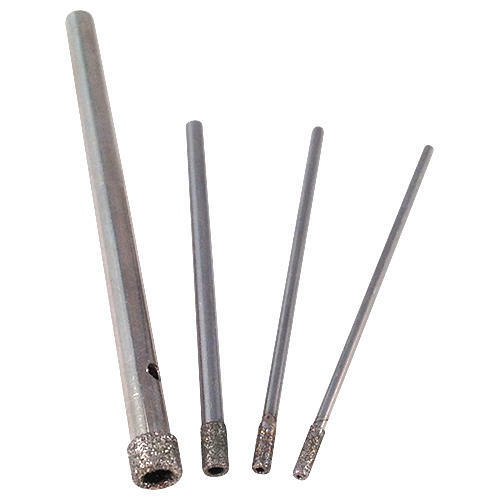 I want to drill out a hardened steel tap that I have broken in a hole in an aluminium casing. The broken stub is too hard to drill out with a conventional HSS drill. 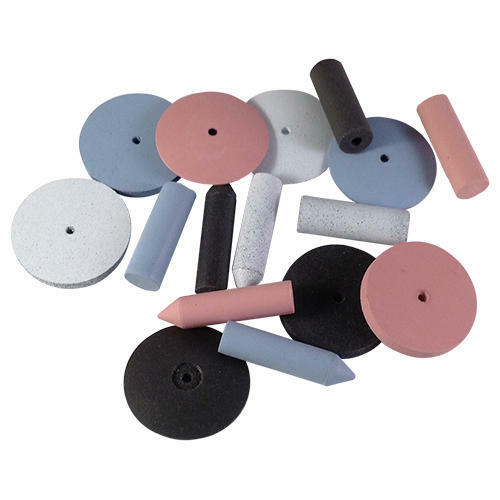 The diamond coated core drills are only to be used on glass , stone and ceramic type materials. They are not for drilling holes in metal. If the HSS is not strong enough you will need to use a tungsten carbide drill bit such as our carbide micro drill bits. Alternatively you can grind out the stub using a tungsten carbide burr. We have lots of diameter sizes, shank sizes and shapes of the tungsten carbide burrs. we wanted to make a 5mm hole. Is that possible? In stones from the beach. Yes, you will need a 5mm diamond core drill.